Women in Saudi Arabia have cast their first votes in the country's history, in municipal elections. Women were also standing as candidates, another first, despite the conservative kingdom being the only nation where women are not allowed to drive. A total of 978 women have registered as candidates, alongside 5,938 men. Female candidates have had to speak behind a partition while campaigning or be represented by a man. Turnout was high, state media reported. About 130,000 women registered to vote, officials said. That figure still falls well short of male voter registration, which stands at 1.35 million. 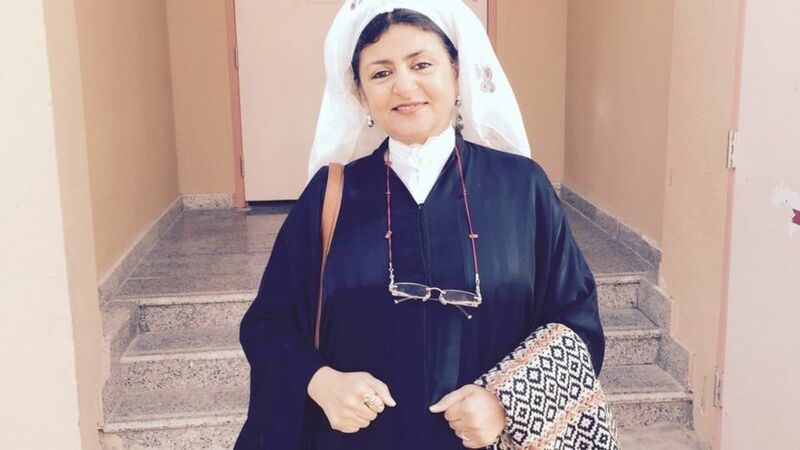 Salma al-Rashed was the first woman to register to vote. "It felt really good," she told the BBC. "Change is a big word but the election is the way to make sure we are really represented." The election is for municipal councils with few powers, but it's a milestone for Saudi women. As soon as the polls were open at 0800 local time in Riyadh, Hatoon al-Fassi rushed to cast her vote. The Saudi academic and women's rights campaigner had to be driven there. Women are still banned from taking the wheel here. She voted in an almost empty polling station, for women only. The election is segregated, like everything else in this deeply conservative society. "It feels great," she said as she emerged, with a huge smile. "This is a historical moment. I thank God I am living it." She has been pushing for this day for more than a decade. Ms Fassi said it did not matter how many women actually get elected. "I am not really worried about the number, or to have any women winning," she told us. "The fact that we have gone through this exercise is what really matters." Elections themselves are a rare thing in the Saudi kingdom - Saturday will be only the third time in history that Saudis have gone to the polls. There were no elections in the 40 years between 1965 and 2005. The decision to allow women to take part was taken by the late King Abdullah and is seen as a key part of his legacy. In announcing the reforms, King Abdullah said women in Saudi Arabia "have demonstrated positions that expressed correct opinions and advice". Before he died in January, he appointed 30 women to the country's top advisory Shura Council. There are 2,100 council seats available in Saturday's vote. An additional 1,050 seats are appointed with approval from the king. The results of the elections are expected to be announced later on Saturday.